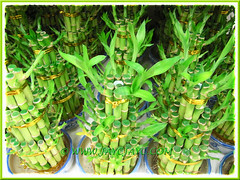 Whenever the Chinese Lunar New Year approaches, traders far and wide will be laughing all the way to the bank with pockets full from selling these Lucky Bamboo plants. It’s a very profitable trade during the annual festive season as the plants are in great demand and sold like hot cakes because of its traditional significance in Chinese culture. 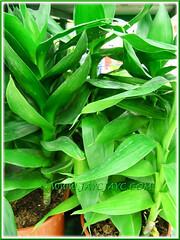 During such times, Dracaena sanderiana are presented in different attractive shapes and sizes. Varying lengths of stem cuttings are bundled together with golden bands, and creatively twisted, bent, twirled and so forth, making them appealing to potential buyers. Their beauty are further enhanced with red ribbons, bows and beads. 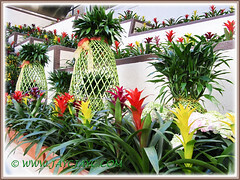 Most buyers grow these plants in water as table ornaments or centerpieces in homes and offices. The larger ones can be placed on the floor as stand-alone specimens or those taller stems with cork-screwed or spiraled tips can be placed in decorative floor vases as a dramatic focal point. These plants are well-regarded in the Eastern practice of Feng Shui, especially by the Chinese, as a symbol of good luck, hence the common name, Lucky Bamboo, though it is not a bamboo at all and lucky?… that depends on the person’s beliefs and sentiments. Our view is that it’s more of a lucrative marketing strategy by businessmen. Nevertheless, we do find the Lucky Bamboo with its luxuriant and glossy foliage, very charming as table decorations in our home. 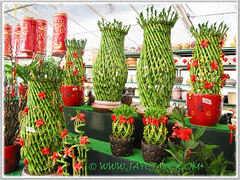 Sharing here a photo showcasing the enormous and spectacular Lucky Bamboo plants that were skillfully and creatively designed, looking like vase-like cages… truly a masterpiece! These were seen towering above other lovelies beside the escalators leading to First World Hotel at Resorts World Genting (Genting Highlands Resort) during the 2011 CNY festive season. Must have been specially ordered and definitely cost its owner Genting Berhad, one of Malaysia’s leading conglomerate, a bomb (peanuts to them, of course) to decorate its premises with these gigantic and awesome-looking Lucky Bamboo. 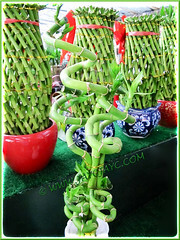 Common Name: Lucky Bamboo, Ribbon Plant, Ribbon Dracaena, Belgian Evergreen. Etymology: The genus name, Dracaena is derived from the Ancient Greek ‘drakaina’ meaning female dragon. The species epithet, braunii was named after Alexander Carl Heinrich Braun, 19th century German botanist whilst sanderiana was named in honour of the German collector and nurseryman, Henry Federick Conrad Sander (1847-1920) who operated in Berlin and England. Origin: Cameroon in west-central tropical Africa. Features: Dracaena braunii (D. sanderiana) is a very popular species of the genus, Dracaena that consists of around 110 species. A native to Cameroon in tropical West Africa where they grow as understorey plants in rainforests, but are cultivated worldwide, mostly as ornamental or decorative indoor plants. It can either be grown in water, growing very slowly, or in potting soil at a moderate growth rate in the ground or containers. It does better in soil. Dracaena braunii is an evergreen perennial shrub with an upright growth habit and can reach to about 1.5m (5 ft.) in height. It has stems that are slender, erect and flexible. Thus, the stems are usually cut into various lengths that can be twisted, bent and creatively arranged into appealing shapes and sizes and grown in water as table ornaments or used as floor decor. These are especially popular during the Chinese New Year festive season. The dark green leaves are glossy, 15-25cm (6-10 in) long, ovate… broadest at the lower half (approx. up to 5.5cm or 2.25in wide) and tapering gradually towards the apex, entire and arranged in opposite pairs and slightly spaced between. There’s an attractive cultivar with white-variegated margins. 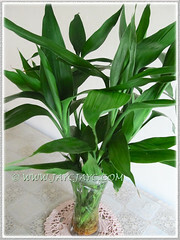 Dracaena sanderiana or Lucky Bamboo is known to bear flowers but very rarely in cultivation. You can view an image of its beautiful flowers by Mableinsingapore, fragrant and rather striking in white against the dark green foliage, quite similar to the blooms of White Sansevieria that are scented too. Flowering will last for some time as the buds burst out sequentially, beginning with the outer circle towards the center. Culture (Care): Dracaena braunii or D. sanderiana (Lucky Bamboo) is a hardy plant that can be easily grown and need the least care. Light: Ideally, bright indirect light indoors, and partial sun or filtered sunlight outdoors. Avoid direct sun that may bleach the foliage. Tolerates low-light to shade, but growth will be a tad slower with lighter foliage colour. Moisture: Medium water regularly, with soil kept evenly moist but not soggy. Occasional misting or showering of its foliage is beneficial as it enjoys a humid environment. Insufficient watering or too low humidity can result in tip burn. Soil: Prefers humus-enriched and well drained soil, though any commercial potting soil is fine too. 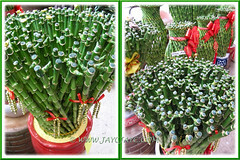 Others: Not necessary to fertilize Lucky Bamboo plants grown in water. However, feeding them with a few drops of aquarium plant food when you change the water is beneficial to produce darker green foliage. We have them in water (as pictured in the 2nd image from the top), for over a year without any feeding and the plants are as lustrous as ever, with occasional rain showers whenever available. Best to use non-chlorinated or filtered water, but if unavailable you can use tap water which has been left overnight for the chlorine to be evaporated first. Try changing the water every fortnightly. If grown in potting medium, feed once monthly with a balanced houseplant fertilizer. Overfeeding will cause plants to turn yellow or leaf edges will turn brown. During hot seasons, occasional shower on their foliage is recommended to keep it dust-free and maintain humidity to rejuvenate growth. Tip burn is a sign of insufficient watering, too low humidity, fluoride toxicity or high soluble salts. Dracaenas are generally free from pests, but do check occasionally for aphids, scales and spider mites. For subtropical and temperate regions: Hardiness: USDA Zone 10a-11. Winter hardy to 30°F (-1.1°C), though some have claimed it as being hardy to Zone 9: 19.4°F (-7°C). For non-hardy regions, grow Dracaena braunii as houseplants in water or soil. Get more tips on how to grow and care for Lucky Bamboo as indoor plants from other temperate gardeners at Dave’s Garden, by following the link at the end of this post. Propagation: By stem cuttings or tip cuttings. You can either root the cuttings in water initially or plant them straight into moist soil. Usage: Present a pot of Dracaena braunii/sanderiana or Lucky Bamboo plants as a gift as it’s believed that the receiver will have good luck. A great indoor plant as table ornaments or floor decor for homes and offices, whether grown in water or soil as it’s hardy, slow-growing and fuss-free. It grows as well outdoors, in planters/containers or in the ground, and will be catchy if planted in garden borders/beds and surrounded by low-growing colourful/variegated plants. Being a shrubby plant, many can be grown close together to form hedges or screen. For non-hardy temperate regions, Lucky Bamboo can be grown as indoor plants in homes and greenhouses.